Happy Friday, all! Another week has passed, and as we approach one of my favorite holidays of the year, I have another great update for our Backers. As usual, let’s start with as little preamble as possible. Today’s Fall Trio Reveal (https://www.youtube.com/watch?v=kGDio14FOCc) was a lot of fun, wasn’t it? Shapeshifters! Surprised? Based on what we had been reading on the Forums, we thought there were going to be a lot of surprised people during this stream, and we were right. This trio, I must admit, is one of my favorite class trios in the design. A shapeshifting bunch of badass boys and girls like the Enchanted Knights, Children of Loki, and the Black Riders belongs in the world that we are creating, don’t they? And the best part, from my perspective, is that once again these classes are based on the lore, mythology, and legends of our three Realms! Even more than usual, all three of these Realms have a lot of lore surrounding shape-shifters and the role that changing shape has in important events. Now, we are putting our own twist on these stories, but the fact is that for the lorehounds among us, bringing something like the Dullahan to life as a playable class is very exciting. I can’t wait to play them! Unfortunately, we are all going to have to wait a while for these folks, because they will not be added until after launch. As we said during the presentation, we had hoped to make this class an upcoming Stretch Goal, and you can just imagine how tempting it is for us to do so. However, we have no right to make that kind of Stretch Goal until we are locked in for launch. OTOH, it does give us more time to get them “just right,” and we certainly won’t have to rush them in post-launch. We’ll have the time that it will take to balance these folks out. FYI, since this has been asked on the Forums, these classes are slotted in after all the stealth-based classes, as well as spirit pet classes. For more information, head over here (http://camelotunchained.com/v2/class-reveal-shapeshifters/). 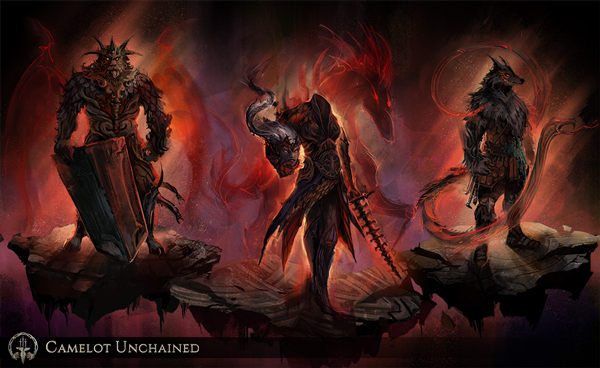 Another subject that came up during the reveal are the Backer’s Rewards. I started a discussion on our Forums (look in the Something to Think About section) about our initial plans, asking for feedback, suggestions, etc., and we certainly got exactly what we were looking for there. Special thanks to Ludovic, who went all BSC with suggestions, and I think set a record for most useful posts in a short amount of time. Some of his and other Backers’ suggestions have been put into my spreadsheet. We hope to unveil the final vision for this system next week, and add them to our Beta checklist. I’m glad to see the overwhelming support we have received from all of our Backers for these pre- and post-launch rewards for all of our Backers and our players. As a Backer, I’d like to be able to damage, and ultimately destroy structures in the world. As a developer we continually need to update our software. As a Backer, I’d like to test the updated male Golem model. As a Backer, I’d like to test the updated female Golem model. As a Developer, I’d like a way to be able to edit gameplay variables on the server, live. As an Italian Backer, I’d like to visit the Italian version of the Camelot Unchained website. As a Designer, I would like to know gameplay information about the state of the game. As a Backer, I’d like to test the male Silverhand model. As a Backer, I’d like to test the female Silverhand model. As a Backer, I’d like to have more payment options in the Camelot Unchained store. 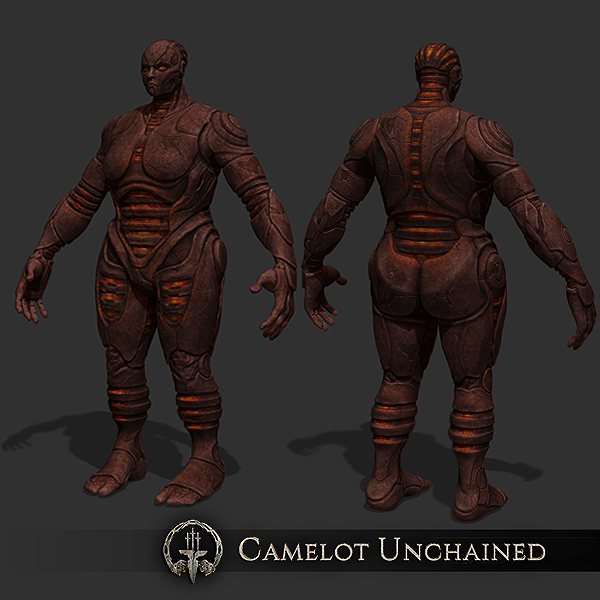 As a Developer, I’d like to reward our Backers for their continuing support of Camelot Unchained. Not bad, eh? We’ve been thrilled with our new team members, and we thank all of our Backers for making them possible, through our Stretch Goals. You folks paid for them, and they have lived up to our expectations. As for other stuff, all the final approvals on swag are done, and the final touches are being put on the store by our partner. We will have a separate announcement on this soon, and when you head over there (as we hope you will), you’ll see that the extra effort we’ve made was worth it. For now, we will be offering two different posters, one t-shirt, and one sweatshirt (hoodie, front zipper) for you. We’ll expand our offerings based on Backer support, but everything will be done with top quality, not rushed, and as close to perfect as we can make them, as well as with your experience with our partner in mind. For example, our t-shirt has front, back, and shoulder printing. No cheap, quick, “make a fast buck” stuff from us, never, ever. And, of course, we will use 100% of our profits from the swag to meet whatever the current Stretch Goal will be, when we receive the disbursement from our partner. On the art side, the team has been doing a great job on delivering Beta-focused items, whether it is on armor, female characters, etc. I hope you enjoyed Jon’s live streaming of his work on the female Fir Bog, which you can find here (https://www.youtube.com/watch?v=qSlwoX5urc8). Here’s a fun, Fall-themed piece of art from Michelle and Sandra. And here’s an update on our female Golem, from Jon. In other news, we’ve updated the tools we use to produce the game to make our engineers more productive and our client more performant. This changes some of the low level libraries required to run our game, and you’ll need to have those installed to run the game. We’ll be releasing an updated installer which will install these libraries for new users, but if you’ve already installed the patcher you’ll need to download and install them yourself. This is required for users participating in any Hatchery (IT/Alpha) tests and will soon be required for users participating in Wyrmling (IT/Alpha/Beta) tests. This weekend’s testing is a going to be a “two for one” or, as we used to say growing up, a twofer. We believe we tracked down last weekend’s crashing bug (it was the bots! ), so we are already running a “72 hours of Alpha, Beta, and IT” weekend on Wyrmling. And not to be outdone, our Hatchery branch will also have a “72 hours of Alpha and IT Testing” for the current build, since it has some very important new additions (like Andrew essentially re-writing the core memory system for the game), that we really want to test this weekend. So, come on in folks, and help us test/break stuff on both server clusters. Tl;DR Hatchery/Wyrmling are now open for business! More info in the emails sent/sending to our Alpha, Beta, and IT-folks. This is what a crowdfunded game, and dedicated access tiers, should be all about, right? Lots and lots of testing, feedback, etc. And the best part? We are, as always, focused on building working code and fixing things first, before moving on to the sexier stuff. This is how you craft an engine and technology that is built to last, and we will not waver in this approach. Well, that about wraps it up for today’s update. As always, we thank you for your support! Tagged 2015, 23rd, Camelot, Evening, Friday, October, Unchained, Update.